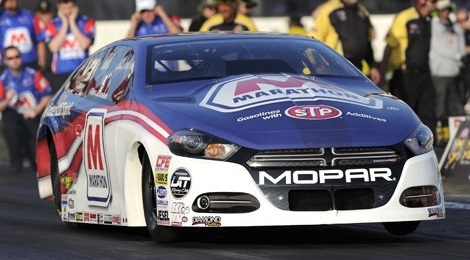 MORRISON, Colo. — If there was ever a race for former Pro Stock world champion Allen Johnson to break out during the Mello Yello Drag Racing Series season, it would most definitely be this weekend’s 37th annual Mopar Mile-High NHRA Nationals at Bandimere Speedway. Johnson has dominated on the mountain over the years more than anyone in the NHRA, winning six times and advancing to nine straight final rounds. To make a 10th straight final and earn his fourth win in the last five years at Bandimere Speedway, Johnson will need his best showing of the season in a year that has been dominated by the Pro Stock tandem of Jason Line and Greg Anderson. Their performance, which includes winning all 13 races, in the new era of Pro Stock looks similar to Johnson’s recent reign over the class in Denver, which the Greeneville, Tenn. native hopes can translate into his first victory of 2016. “I think we’re getting closer every time we test and we have some hardware coming on board in Denver and hopefully that’ll pay dividends,” said Johnson, who is currently fourth in points in his Marathon Petroleum/J&J Racing Dodge Dart. Sunday’s finals will be broadcast live on the FOX national broadcast network for the first time in NHRA history and Johnson would love to return to the familiar winner’s circle in Denver, after losing in a thriller to Larry Morgan a year ago. Johnson has become a master of conquering the elevation at Bandimere Speedway, driving at an elite level against a talented host of competitors. The redesigned Pro Stock class, which features fuel-injected engines, flat hoods, 10,500 RPM rev-limiters and shortened wheelie-bars, will have its first go on the mountain in 2016 and while confident, Johnson is eager to see how his new car reacts to racing at an elevation of more than 5,800 feet. Getting his first win of the season and continuing his Denver expertise would be added icing on the cake with the Mello Yello Countdown to the Championship also closing in. Closing the gap on the points leader Line, who has seven victories, and Anderson, who has six wins including at the most recent in Chicago, has become the goal for Johnson since the outset of the season. He has certainly made progress, advancing to a final round in Epping and winning at least one round over the last eight races, but there are more improvements to be made. With only four events following Denver before the Countdown to the Championship, Johnson still has hopes of moving into third in points, and a strong showing at one of his favorite tracks and races would be an ideal way to kick off the famed three-race Western Swing. That means competition will be tough at the Mopar Mile-High NHRA Nationals and certainly starts with Line and Anderson. But Johnson is also wary of a number of Pro Stock standouts who have made big improvements in recent races, including Bo Butner, who is third in points, two-time and defending world champ Erica Enders, Jeg Coughlin, Drew Skillman, Shane Gray and Vincent Nobile. Racing in Denver, though, remains a special deal for Johnson, who hopes to create one more magical moment on national broadcast television.